Update: The price dropped on Amazon to the lowest ever! Card games are perfect for taking on trips. This one is a fun twist on Rock Paper Scissors for ages 4 to adult! 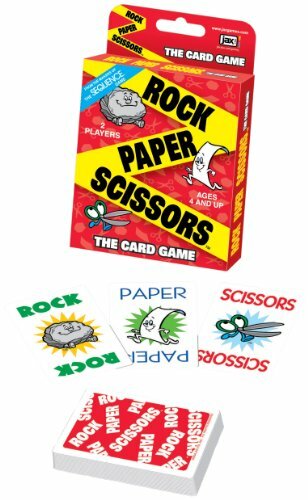 Hurry and get the Rock Paper Scissors Game today for only $3.53 from Amazon! Save BIG off the regular price of $9.99. Check out all of the recent Amazon deals here! Amazon Prime members get FREE 2-day shipping!! If you are not a Prime member, get FREE shipping when you purchase $25 or more of eligible items across any product category. Check out the Rock Paper Scissors Game details below. The fun fast pace game helps kids sort out issues and decide which gets to make decisions, pick the seat they want etc. Perfect inexpensive party favor or stocking stuffer. Fun, portable play anywhere game that keeps kids happy in the back seat or hotel. English and spanish game instructions. Here’s the fast & fun CARD VERSION of the game kids have played for generations. Each player lays down a card. If your card beats your opponent’s card, you take it. When all cards have been played, the player who has collected the most cards wins the game!! 2 players. Buy the Rock Paper Scissors from Amazon.